St. John's Prep is hoping 2018 is finally its year to bring home the Super Eight title. Our Preseason MIAA Baseball Rankings, as selected by our team of editors and correspondents. 1. Central Catholic (Last Year: 20-4) Coming off their first Super Eight appearance, the Raiders return all the components of a team primed for a deep June run. 2. 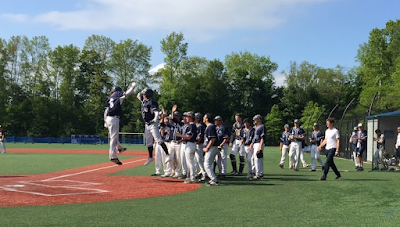 St. John’s Shrewsbury (Last Year: 22-4): The defending Division 1A Super Eight champions certainly lost a large part of last year's success to graduation, but Sean Burke and Nick McDonald are at the center of a strong returning core. 3. St. John’s Prep (Last Year: 18-7) St. John’s Prep has reached the Super Eight final three straight seasons only to come up just short. The Eagles look ready for another try at the title with a deep staff and a quality middle of the order. 4. Boston College High (Last Year: 15-10) With Major League Baseball Draft prospect and Virginia commit Mike Vasil back in the fold, the Eagles should be in contention for their first Super Eight championship. 5. Braintree (Last Year: 16-8) As always, the Wamps are expected to have one of the more standout lineups in the Bay State. Catcher Alex Kennedy is one of the top players to watch. 6. Newton North (Last Year: 14-10) Catcher Cole Whitehouse and shortstop Dante Taylor hope to help the Tigers’ manufacture enough runs to complement a quality staff. 7. Wachusett (Last Year: 17-7) The Mountaineers came up a run shy of a state final berth last season, but with Cole Durkan and Jake Gigliotti back in the mix Wachusett should contend with St. John’s (S) for the top team in Central Mass. 8. Austin Prep (Last Year: 20-5) No Div. 3 team has made a Super Eight appearance so far in the tournament’s four year history but the Cougars have the talent to change that. 9. Belmont (Last Year: 17-5) The Marauders will have some work cut out for them coming off a terrific season that landed them a Super Eight berth. Nate Espelin is back atop the rotation, which makes them a contender once again for the Middlesex League Liberty title. 10. Lexington (Last Year: 18-7) Lexington made a late surge at the end of last season to make its way into the Super Eight bubble conversation. Boston College bound shortstop Sal Frelick is back for the Minuteman who have beefed up their non-league schedule. 11. Taconic (Last Year: 24-1) The defending Division 1 champions lost 13 kids to graduation, but they should have the talent to be back towards the top of the West once again. 12. Andover (Last Year: 18-6) The Golden Warriors are sure to give Central Catholic a run for its money in the Merrimack Valley Conference’s large division. Hard throwing right-hander John Marotta leads a premiere pitching staff. 13. Xaverian (Last Year: 14-9) Gerry Lambert’s team is deep on the mound with Northeastern bound Owen Langan leading a staff that includes veterans Sean Birch and Dan Vaglica. The question for the Hawks will be offensive consistency. 14. Walpole (Last Year: 14-8) The Rebels are strong on the mound once again, but will face stiff competition in the Bay State Carey on a daily basis. 15. Danvers (Last Year: 21-5) The three-time defending Div. 2 North champions find themselves as the preseason favorite in a loaded Northeastern Conference. 16. Franklin (Last Year: 17-6) Franklin very well could be a dark horse Super Eight contender with ace Jake Noviello highlighting a stalwart staff. 17. Peabody (Last Year: 14-8) Tanners should be in the thick of the Northeastern Conference race behind 2017 league MVP Jake Gustin. 18. Silver Lake (Last Year: 14-7) Lakers are hungry to climb back atop the Patriot League Keenan after falling to Whitman-Hanson at the end of last season. Dan Collins is one of the top way players in the South. 19. Wellesley (Last Year: 16-10) One year after going on a Cinderella run to the Div. 1 State Final, the Raiders could find themselves in the mix once again with Virginia Tech commit Henry Weycker back as the team’s ace. 20. Westfield (Last Year: 15-7) Recent Quinnipiac commit and two-way standout Jimmy Hagan hopes to lead the Bombers towards the top of the West. 21. Auburn (Last Year: 21-4) Defending Div. 3 State Champions should be back in the hunt come June. 22. Lynn Classical (Last Year: 19-2) Rams bring back a strong core from a unit that went 19-1 in the regular season just one year ago, but the move up to Div. 1 is sure to bring new challenges. 23. Brookline (Last Year: 13-10) Brookline has the talent on the mound to keep up with anyone in the Bay State. 24. Lowell (Last Year: 17-8) Danny Graham's team will definitely miss Henry Funaro, but Matt Draper has shown he can beat any team in the Merrimack Valley Conference on any given night. 25. Malden Catholic (Last Year: 12-9) The Lancers have the pieces to push their Catholic Conference counterparts.